0.42 ACRES - Flat Commercial Property On Main Street Dominical With Amazing River And Ocean Views!!! 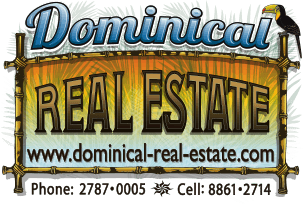 This is one of the only commercial property available in Dominical. It is located right on the main road, about 300 meters into town off the highway and right across the street from the soccer field. It is the perfect location for a commercial activity with tons of exposure to everyone that goes through town. To the right is the Spanish school and to the left is a bar and restaurant. The almost half acre property is completely flat and usable and has some beautiful large trees in the back. It also backs onto the Baru River. This property is perfect for a commercial center, a restaurant, a hotel, a BnB, or a home. From a second story, there is an amazing view of the Baru River, the Hacienda Baru Nature Reserve, and the ocean with sunsets too!!!! A restaurant or hotel with this view would be amazing. The property has power and water and is just waiting for someone with the right vision to come along and build. Dominical is growing rapidly, and commercial property is basically non existent. This is a great investment and it won't last long.